Vinpocetine is a derivative of the natural alkaloid vincamine, an extract of the dwarf periwinkle (Vinca minor), the qualities of which are present in Vinpocetine but with two to four times greater efficacy! Vinpocetine is remarkably free of side-effects and contraindications. It has been the subject of over 700 scientific publications in recent years, 200 of which were animal or human studies. Vinpocetine's main benefit is that it supports brain metabolism, and therefore alertness, by increasing synthesis of adenosine triphosphate (ATP), the universal energy molecule. 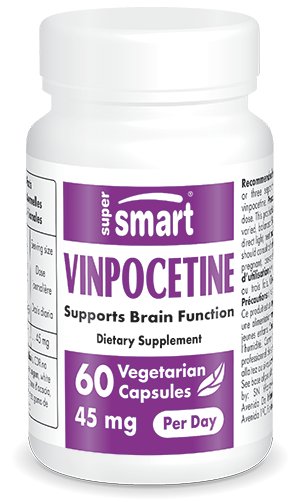 Vinpocetine improves the brain's utilisation of oxygen and reduces platelet aggregation. In fact, the first studies conducted on this compound recommended its use for mainly hypoxia-related problems (oxygen insufficiency) or ischaemic problems (insufficient blood flow). In these conditions, vinpocetine exerts a significant neuro-protective effect, saving up to 50% of neurons which would almost certainly otherwise be lost! Vinpocetine also increases the synthesis of several neurotransmitters affecting critical brain functions such as memorisation, concentration and mood. A number of studies show a perceptible improvement in cognitive performance following supplementation, particularly in one of the most difficult areas to influence, synaptic plasticity, which, in a way, is the cellular model for learning capacity. Finally, vinpocetine is frequently used for its vasodilatory properties in sensory, hearing and visual problems of vascular origin (vertigo, tinnitus, buzzing in the ear, noise pollution, retinopathies). According to Dr Jack Vernon, American tinnitus expert, “vinpocetine is a very promising substance”. Several studies have shown a significant improvement in hearing following supplementation with 30-40 mg vinpocetine a day. Other studies have shown that vinpocetine improves a number of visual deficiencies, related in particular to macular decline, poor night vision and glaucoma. Each capsule contains 15 mg pharmaceutical grade vinpocetine.